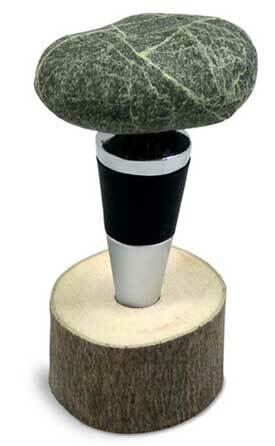 Sea Stones Bottle Stoppers...bring the beauty of nature into your home! Each Sea Stones Bottle Stopper is an original... Mother Nature makes no duplicates. Each Sea Stone bottle stopper has a stainless steel base, "stainless & stone last lifetimes & their handsome looks never change." Sea Stones bottle stoppers are perfectly leak-tight, air-tight, & a bottle will not leak on its side in the refrigerator. "Tactile & Practical"... not only are Sea Stone bottle stoppers "green," the real sea stone top is ergonomic, a pleasure to hold, & allows the bottle to be securely closed & easily opened. Each Sea Stone stopper comes with a Solo wood base. "Stones with a story"...Collected with permission from New England rivers & beaches, Sea Stones LLC, having deep respect for nature & our planet, "replants" a rough quarry stone in the water for each smooth stone they collect to be tumbled into smoothness. They also replant 10 times the number of trees they harvest for their work! Each Sea Stones Stopper comes with a Solo wood base. Each Sea Stone is a one-of-a-kind & will vary in shape & color.